Elaine Feinstein was educated at Newnham College, University of Cambridge. She has worked as a university lecturer, a subeditor, and a freelance journalist. Since 1980, when she was made a Fellow of the Royal Society of Literature, she has lived as a full-time writer. In 1990, she received a Cholmondeley for Poetry, and was given an Honorary D.Litt from the University of Leicester. Her versions of the poems of Marina Tsvetaeva � for which she received three translation awards from the Arts Council � were first published in 1971. 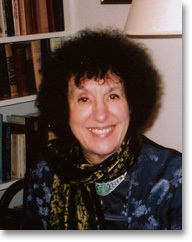 She has written fourteen novels, many radio plays, television dramas, and five biographies, including A Captive Lion: the Life of Marina Tsvetaeva (1987) and Pushkin (1998). Ted Hughes: The Life of a Poet (2001), was shortlisted for the biennial Marsh Biography Prize. Her biography of Anna Akhmatova, Anna of all the Russias, was published in 2005. Elaine Feinstein has travelled extensively, not only to read her work at festivals across the world, but to be Writer in Residence for the British Council, first in Singapore, and then in Troms�, Norway. She was a Rockefeller Foundation Fellow at Bellagio in 1998. Her poems have been widely anthologised. Her Collected Poems and Translations (2002) was a Poetry Book Society Special Commendation. She has served as a judge for the Gregory Awards, the Independent Foreign Fiction Award, the Costa Poetry Prize and the Rossica Award for Literature translated from Russian, and in 1995 was chairman of the judges for the T.S. Eliot Prize. Her most recent novel is The Russian Jerusalem. A much extended selection of Maria Tsvetaeva's poems, Bride of Ice, will be published by Carcanet in June 2009.